This is the first set of photos of places around the Crimea - maybe the most amazing area I've ever been to in it's diversity. 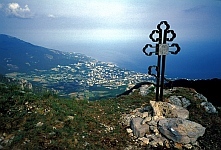 I think of the Crimea as a little continent 0 in its 2400km2, you can find a Mediterranean coast with vineyards and olive groves, pine foreasts, mountain cliffs and alpine meadows, one of the largest remaining beech forests in Europe, steppes... It's amazing. Ok, here we go with set 1, as usual in no order except how I found and added them in my files - see more on categorized photo pages. 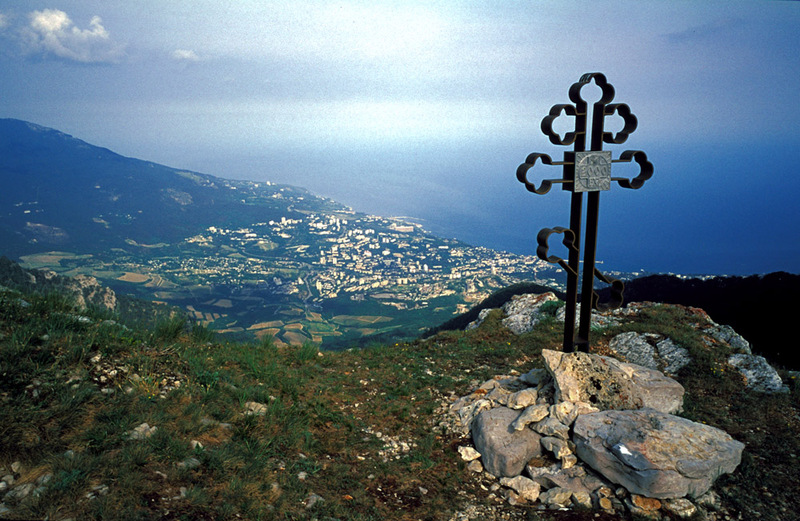 Looking down to Yalta from the edge of the Yaila. This one is from my first hike over the mountains from the interior alone back to Yalta. I'd done it a number of times before with my friends Valery Kuznetsov and others, but this trip was nice since I could go at my usual pokey, look-around way, as opposed to the higher speed of my Crimean friends.